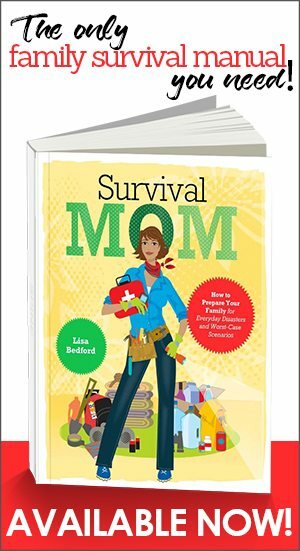 A few years ago I read about a woman who moved from the Southwest to New York City, and a hurricane hit two days later. She had no idea what to do. Why would she? She was used to droughts and brush fires, not preparing for a hurricane with its devastating winds and massive levels of rainfall. 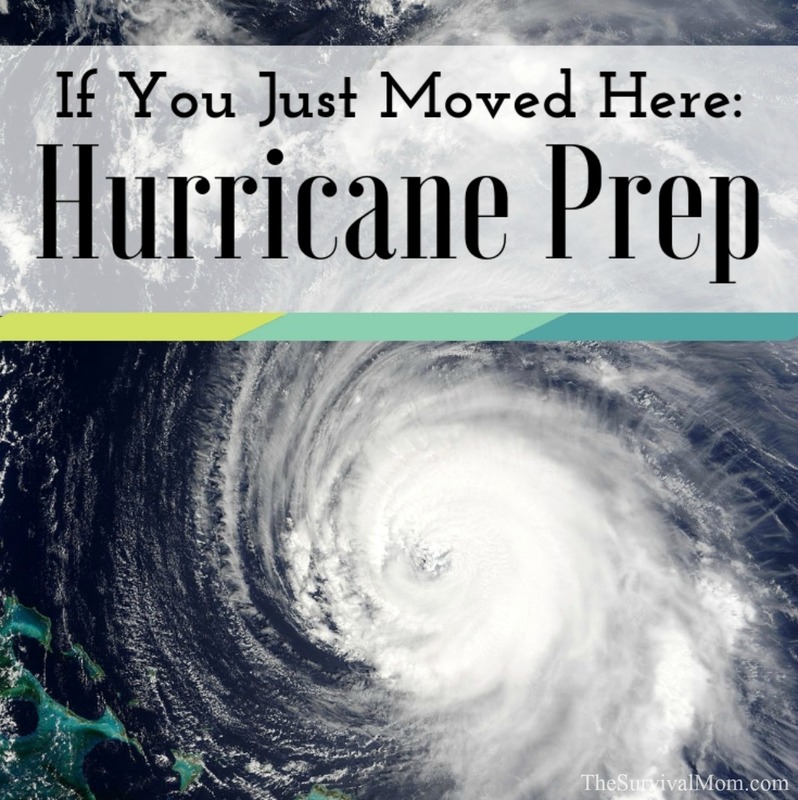 If you are new to hurricane country, and you are if you live within 100 miles or so of the Atlantic and Gulf coasts, then these tips are for you. Even if you’ve weathered a hurricane or two in your time, you still might find something new to help you better prepare for the next one. And there will be a next one! 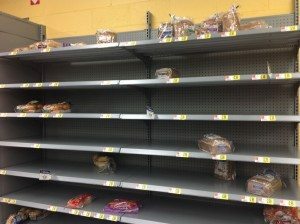 All disasters have several things in common: emergency service disruption, empty grocery stores, potential for panic, loss of phone service and electricity, and so forth. But all disasters also have their own nasty little unique signature, and newcomers shouldn’t have to find out the hard way what they are. 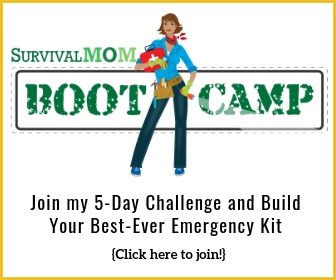 So I started thinking about what newbies can do to make very basic hurricane preparations in just a couple of days. I have two aims here. 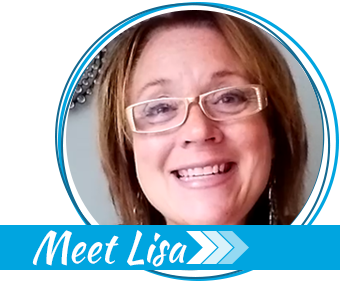 First, I want to provide you with a few Very Basic Shopping Lists for urgent, minimalist prepping — if that’s all the time and money you can spare. Next, I’ll provide tips for hurricane-specific prepping. The local stores will not have much. Hurricane-force winds are in excess of 70 miles per hour. They can snap trees, utility poles, and even church steeples. They can rip off siding, roofing and gutters. Now, add the likelihood of pounding rain to the mix and you quickly realize that your house needs prepping as much as your family does. Outdoor furniture, grills, doghouse, etc. all need to be stowed indoors. Garages and basements are preferable to sheds, which could get flattened. Do any shutters (close them if they actually move), gutters, roofing or trim seem iffy? Strap, nail, bungy or duct tape them down now before they become windblown projectiles. This doesn’t just protect your home; it also helps prevent damage to other homes and the lawsuits that can follow. 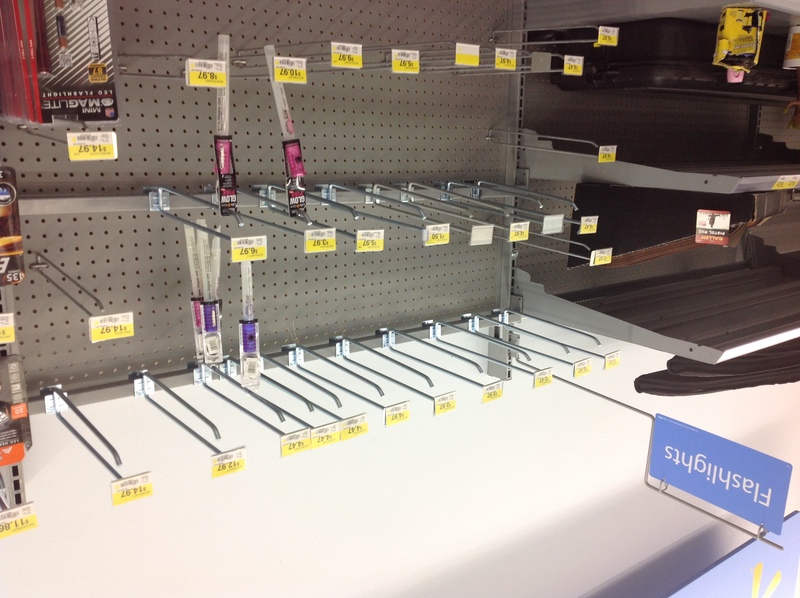 The worst place to be the day before a hurricane is a grocery store, Walmart or a home improvement store. Most of the good stuff is gone in a flash, the lines are an hour long, the credit swipers fail, tempers flare in the parking lot and there are often teams of pickpockets working the place. Instead, try smaller hardware stores and places like Big Lots and dollar stores. Wherever you go in your pre-hurricane prepping, go in the morning, bring at least two people (for heavy stuff and to divide and conquer) and bring well-guarded cash. All of that goes double for hunting/camping stores. Chain saw for removing fallen trees but buy this only if you already know how to use one and have the cash. 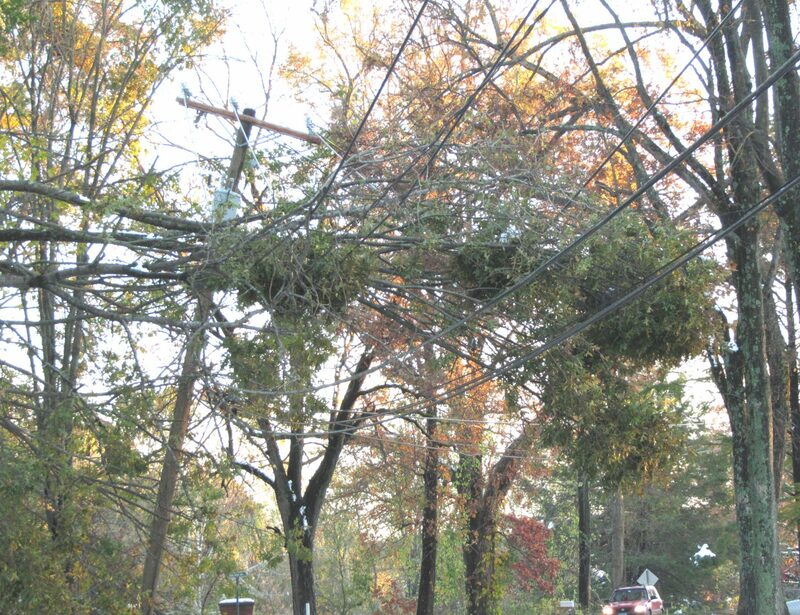 Never, never, never attempt to remove a pole, tree, or anything else that’s touching power lines! My Dad and brothers, all either firefighters or police officers, had a highly technical term for people who do this. The term was,”the deceased”. Check out this Costco shopping list for “apocalypse shopping” for more ideas. There’s a very good chance of power outage in a hurricane. It usually lasts just a couple days, but during Hurricane Sandy it was an entire week! And we didn’t even live in the boondocks. If you choose to buy and use a generator, make sure you have enough fuel and outdoor extension cords. Generators have come a long way and are now very simple to use provided you follow all safety protocols, especially proper ventilation! TIP: Learn more about buying a generator. Good advice here. If you use a generator, it will need to be kept outside. Be sure to have a way to secure it to a wall or something else strong and stationary. During one hurricane, homeowners reported waking in the morning to find a running lawnmower sitting where their generator had been the night before. Yes, generators become a hot commodity for thieves who know they can easily sell them to desperate people. For light, candles are good but battery powered LED lanterns are better. Here’s a Very Basic Shopping List to help you prepare for loss of power and lights. Generator, if you know how to use one and have the cash. Don’t assume that a neighbor will be able to help you figure out how to use one. They’ll have their own problems to deal with. Battery powered radio, preferably with hand crank. If it has a solar panel, that’s even better. Lots of batteries in various sizes. 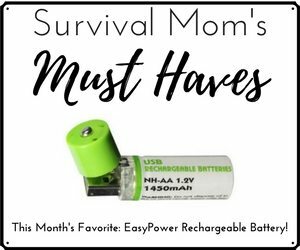 Truly, you can never have too many batteries. Keep them in their packages until you need them. On the fourth day of the Sandy blackout I heard the neighbors having a 15-round, multi-combatant screaming match over who used the last packet of ketchup. Clearly, Cabin Fever and Electronic Withdrawal had claimed another family. Even if you have a generator for your TV, the cable may be out. Many Americans no longer keep DVDs, preferring to pay for on-demand and Netflix, which may also be down. The video games will keep kids occupied, until the generator gives out. It’s folly to be electronically addicted anyway, but let’s leave that for another day. In hurricane country, it’s common to lose power in an area that hardly suffered any damage or to still be blacked out several days after everything appears cleaned up. That’s because the storm may have taken out a major transformer further away or many poles may be down in a small area. Also, there are only so many repair crews and restoration efforts have to be prioritized to stuff like hospitals, fire stations, major roads, Senators’ houses — that sort of thing. Do you own any board games or sports equipment? Do you know the rules of baseball or any other games? Those non-electric forms of entertainment will get you by through very long days and nights. If you don’t have a generator or don’t want to squander fuel on entertainment; just redefine “home theater”. Acting out Shakespeare (complete with cheesy costumes made from curtains) or other famous works is a riot and might even reveal a talented actor in the family. Or why not re-enact/re-imagine scenes from classic movies? Especially ones with costumes, accents and the opportunity to over-act. “Star Trek II: The Wrath of Khan” is particularly fun and can occupy a whole day! Then there’s simply reading to family out loud. This was a common evening activity before TV. Careful about content though; you don’t want to read books about violent crime or vampires and then realize there’s no nightlight! And since you’re “roughing it” anyway, why not go camping in you own yard? Or right in the living room? Your “tent” can be a real tent or couch cushions. Make it a game. Goodwill and Salvation Army are good places for all these entertainments and may also be a good source for things like flashlights, tarps, camping gear, etc. Books, fiction, biographies, and non-fiction. If they’re good read-alouds, that’s a huge bonus. And, hey, did I mention books? Keep them positive and uplifting, nothing dark! There’s a decent chance of flooding in a hurricane due to heavy rain and storm surge . Flooding means contaminated water. Bottled water is the first thing to disappear at the stores, and you should always have at least 2 or 3 cases of bottled water anyway. Even if you have stored water, there are some additional exigent steps you can take. Like scrubbing and bleaching the bathtub to sanitize it (don’t forget a new stopper to prevent leaking! ), and filling it with water. Bathtub volumes vary widely but 30 gallons is a reasonable minimum. Remove anything that might fall in and contaminate the water. You can wash with a cloth or bucket elsewhere. Keep door locked if there are toddlers, elderly, or handicapped children in the house! This will prevent both drowning and contamination. There are also food-grade buckets and washed out soda bottles for water storage. TIP: If you don’t have time to scrub, bleach, and sanitize a tub, consider buying a low-cost WaterBob. I own 2 of them — one for each tub. For sanitation, biodegradable moistened towelettes are a lifesaver and they’re a decent price and widely available. Or there’s witch hazel. Witch hazel is to the bathroom cabinet what duct tape is to the garage. For bathing, dampen a couple inches of washcloth with the stuff, and just wipe down skin in one direction; repeat until clean. To “shampoo”, just wipe down hair starting at part and re-part every few inches as though you were touching up roots. Plumbing can become an issue following a hurricane, and that’s why we store water. So what about the toilet? There are options at camping/ hunting stores or Army/Navy stores if you have any nearby. If you don’t, a few empty buckets (with lids) double-lined with garbage bags and saw dust, dirt, or cat litter will suffice in a pinch. Pour a cup or two over poop, but no need to bother for pee. As for food, a few canned convenience foods for now never killed anybody, especially ones that are acceptable when eaten cold. If the grocery store is already in chaos, bypass the canned meats and soup (which are probably gone anyway) and head to the baking aisle where you’ll find nuts, seeds, dried fruit, coconut, canned/powdered milk and yes,Virginia…chocolate chips. TIP: Print out this list of foods that don’t need to be refrigerated. Great in any emergency. The ethnic food aisles are next: ready-made polenta , instant couscous, pepitas, boneless sardines, etc. Before you brave the grocery store, or if it’s already picked clean, try the Dollar Stores, small ethnic groceries, and odd lot stores. 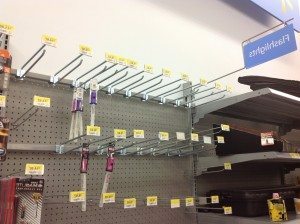 If you’re in a “mart”, the camping/fishing department gets picked over pretty fast, but there may be freeze dried foods left. Canned stew, chili, soup, etc. This is why we prepared ahead. True story. The French toast people strike again! 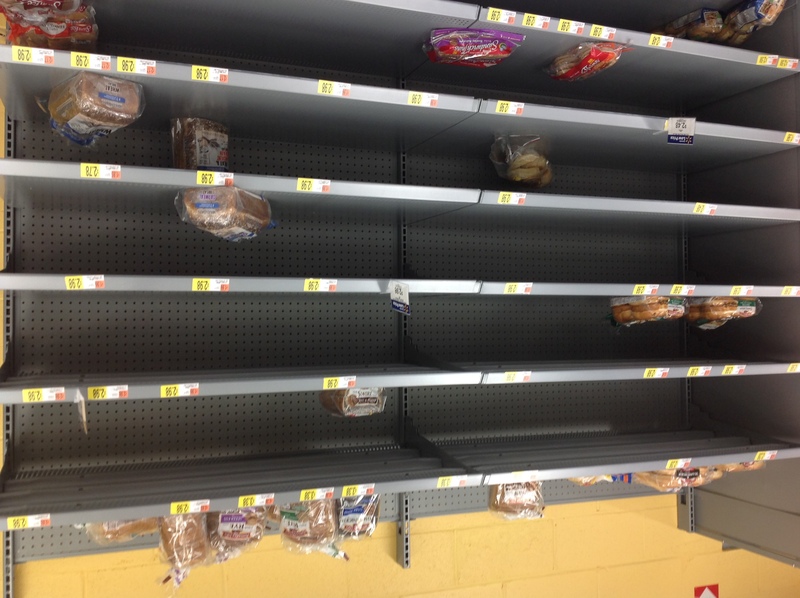 When a storm is coming, half of New England runs out and buys milk and bread. I don’t know why. I could understand it if they bought really healthy bread or also bought peanut butter or canned meats to go on the bread, but they mostly don’t. And what’s with the milk? At least they typically buy cereal, too. But there’s a decent chance you’re gonna lose your fridge. “An Examination of Northeast Corridor Impending-Inclement-Weather-Psychosis and the Maltose/Lactose Acquisition Phenomenon”. Now, lest anybody get their Yankee dander up, I’m not just from New England. I’m from Rhode Island. Chowder-eating, Del’s Lemonade-drinking, quahog-stuffing, Johnny Cake flipping, Rhode Freakin’ Island. Rhode Island invented the bread and milk thing. I don’t know why. Maybe it’s all for coffee milk? I beg newcomers to just take a moment and accept it. Does the South do something like this? Tell the truth, now. Oh, and don’t forget the universal-solvent of Western Civilization. That weight-in-gold substance without which Michael Bay-level destruction, abject despair and possibly cannibalism will surely ensue: COFFEE! Coffee doesn’t matter to me, but at some point during the Sandy blackout I went to the store to see if there was any half-price meat. Alas, no, but I beheld something odd. There were about 10 customers roaming the nearly ravaged aisles and 2 teenage cashiers were standing at their registers with nothing to do but text. But there was a line 52 people deep at the service desk. I know because I counted. As I walked along the line to see what the problem was, I noticed that most of them wouldn’t make eye contact and were awfully sheepish and well-behaved for people in a line so very long and slow. Then I saw that the service desk was not their goal. And I doubled over laughing. 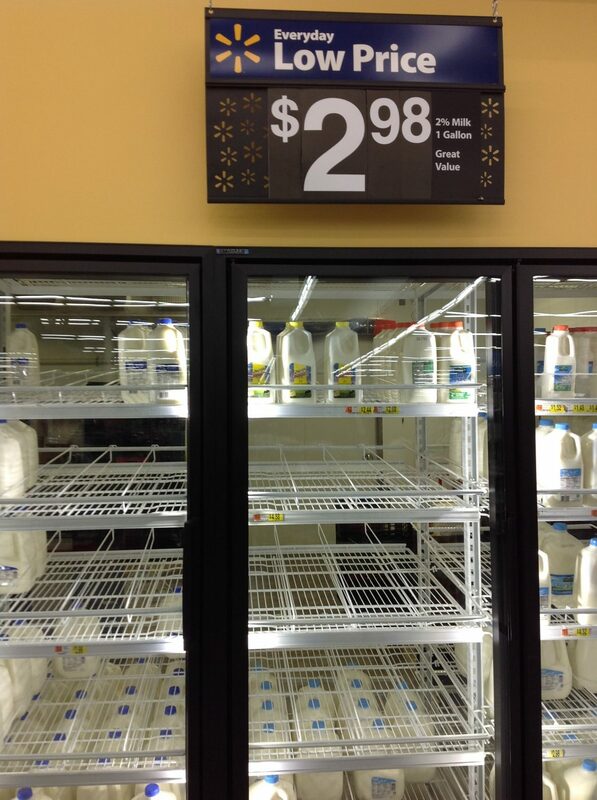 …’cause a bunch of Rhode Islanders grabbed all the milk. I always love this author because I learn AND laugh. I have to admit I got all the answers wrong on how to prep specifically for a hurricane. Thanks for setting me straight. If one ever hits Salt Lake, I’ll be ready. Thanks Sheri! I lived in SLC for several years. One day it rained like normal Back East rain and freaked people out like it was the Apocalypse! One more thing to do. Register for Reverse 911 alerts and updates on your cell from the local first responders. Available in most communities, these provide location specific authoritative information like when to evacuate your area, what routes to take, status of critical recovery efforts, etc. Delivered via voice, text and email, but text is the most reliable after a storm. Also the use of mobile cell towers now make restoration of services much faster. Register from your community’s web site or try ours, http://www.safetyinformed.org to find local services. All free. 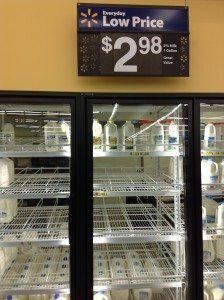 Lol, yes, people in the south wipe out the milk and bread at the talk of hurricanes and the mere mention of snow flurries!! But most people have charcoal or gas for grilling when the “electric” goes out. Good points on the hygiene, thanks! Also, wet wipes can be a God Send! Having been through several hurricanes – the best thing to have is a reservation out of harms way. Always – if local leaders tell you to leave then leave. No reason to stay is worth your life or the lives of loved ones.